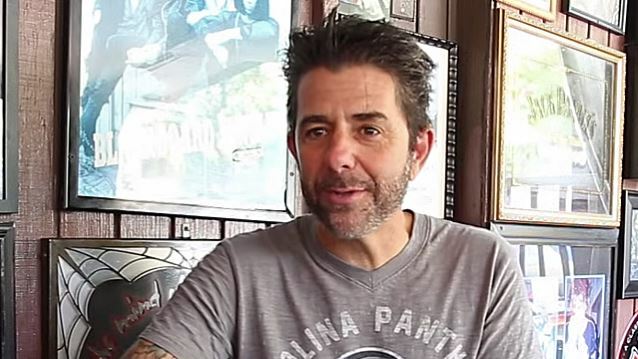 Riki Rachtman's world-famous Cathouse will return to Southern California for one night of debauchery with Cathouse Live At Irvine Meadows, Saturday, August 15 at Irvine Meadows Amphitheater (recently known as Verizon Wireless Amphitheatre) in Irvine, California. A new video interview with Rachtman about the upcoming event can be seen below (courtesy of California Rock News and "Hair Metal Mansion"). Riki Rachtman created the original rock dance club that dominated the Hollywood scene from 1986 until 1993. Now, along with Live Nation and Synergy Global Entertainment (SGE), he's bringing Cathouse Live to a much larger audience with this decadent music and lifestyle festival. Cathouse Live will feature band performances on two stages, VIP meet-and-greets, a vendor village, a chopper motorcycle show, tattoo shops, go-go dancers, and more. Said Rachtman: "I recently started a Cathouse Hollywood Facebook page and everyone was asking, 'Why don't you do another Cathouse?' I loved the idea and mentioned it on Twitter. So many bands told me that they wanted to be a part of it that I knew that I had to bring it back on a much larger scale. It was too big for a club, so we decided to do a festival." He continued: "The music scene isn't what it was like back then — that type of decadence. "We're going to bring the debauchery of the Cathouse back to Southern California! "SoCal needs this kind of rock festival so people will have the chance to go out, have fun and enjoy a great rock show in all its excess. "Cathouse was a very successful weekly nightclub for six years, so we're trying to pack all those years of Cathouse into one night for Cathouse Live. All I want is for those who go to have a good time and say, 'That was the BEST ROCK FESTIVAL EVER.'" Tickets for Cathouse Live At Irvine Meadows are on sale at www.CathouseLive.com and start at just $15 plus fees. Stephen Pearcy of RATT says: "I remember the Cathouse very well… [I] used to go there when off the road with the RATT tours in the '80s. Anything and everything went down there. Great jams, good stories in my book about that place. Everybody was somebody or thought they were, and trashed. You knew you had a good time there when you couldn't remember what you did there the next day! Myself, Riki, Fred Coury, Tracii Guns, Taime and a couple others created a jam band called P.I.G. (PARTNERS IN GRIME). We only did a few shows, got a bus, went out and had a great time. Places like the Cathouse will never happen again. Those were the dayz." The original Hollywood Cathouse was known for its edgy, underground, dirty rock 'n' roll vibe that was rooted in punk. It reeked of raunch and pure decadence. Patrons would freely indulge. The DJ played rock 'n' roll between unannounced performances from bands like GUNS N' ROSES (Cathouse regulars who performed live at the club in 1986 just before their debut record was released), Sebastian Bach, Stephen Pearcy, L.A. GUNS, FASTER PUSSYCAT, JUNKYARD, JETBOY, BANG TANGO, SAIGON KICK, BLACK 'N BLUE, LITTLE CAESAR, and many more. GUNS N' ROSES' video for "It's So Easy" was shot at the Cathouse, and Alice Cooper played the club one Halloween. When Ice-T was banned from every Los Angeles club, Riki invited the rapper's band BODY COUNT to play Cathouse. "It wouldn't be uncommon to see GUNS N' ROSES one week and ALICE IN CHAINS the next — so many bands played before they were huge," said Rachtman. "It was also the kind of place where you'd find Robert Downey Jr. rubbing elbows with AEROSMITH's Steven Tyler." Cathouse was the place to discover the best rock 'n' roll. Ask anyone who ever went to Cathouse…they'll try to piece together what they remember about how legendary it was. With Cathouse Live At Irvine Meadows, the Cathouse is returning for those who lived the legend as it happened and those who are ready to experience this piece of rock 'n' roll history for the first time. "Riki Rachtman is a great ambassador for a whole generation of hard rock," says Live Nation executive vice president Rich Best. "We're excited to partner with his iconic Cathouse brand to bring some of the biggest rock bands of the '80s and '90s together for this event. With over 20 bands that helped define an era with millions of records sold and dozens of hit songs, Cathouse Live at Irvine Meadows is a great value for fans." Los Angeles Times writer Kastle Waserman described Cathouse in her August 23, 2001 feature, noting: "On any given night, high-heeled, platinum blonds vied for attention on the dance floor. Aspiring rock musicians with impossibly teased hair crowded the bar and offered their standard pickup line: 'Come see my band play.' In VIP corners, rock notables mixed easily with Hollywood scenesters…Within weeks of its opening in the late 1980s, the Cathouse became 'world-famous,' L.A.'s place to be for rock 'n' roll kicks. A six-year run saw it evolve from a lightning-strike success into a legendary landmark…"